The CCTV shot of the man being sought by police. 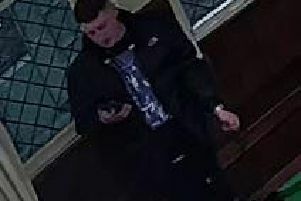 Police have issued CCTV of a man they are trying to trace in connection with a burglary at a pub near Malton. He is shown outside the pub at Appleton-le-Street in Ryedale. North Yorkshire Police has only just released an appeal for information following the theft on March 14 where a window was forced and money stolen from inside at around 3am. A number of other similar offences occurred in the area on the same night but despite extensive enquiries the suspects have not been identified said police. If you recognise the man contact North Yorkshire Police on 101, select option 2 and ask for PC Nicholas Ham, or Malton Police. Alternatively, email nicholas.ham@northyorkshire.pnn.police.uk. or call Crimestoppers on 0800 555 111. Quote reference number 12170042969.